On our online shopping store in Pakistan, you can search and find out PS04 Microphone Pop Filter by Samson Technologies at best price in Pakistan and is of imported quality from the category of Windscreens & Pop Filters online in Pakistan. It is dual layer and is 4.75 inches nylon mesh screen that will reduce "P-Pops". This PS04 Microphone Pop Filter is flexible 8-inch gooseneck so that you can easily adjust filter position. This is one the best Universal mic stand adapter at best price in Pakistan and is of imported quality. It is designed so that with most of the microphones in a studio setting ^4-3/4" dual-layer with nylon-mesh screen and the effect of reducing p-pops assist to ensure you that there is clear vocal transmission. Its steel material offers durability. 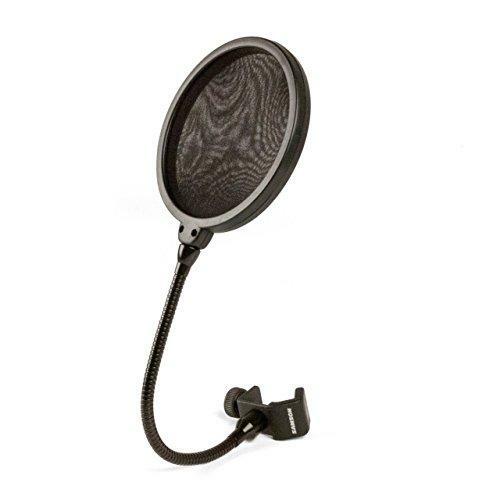 You can have this amazing PS04 Microphone Pop Filter online in Pakistan at best price in Pakistan with cash on delivery. You can also explore other Windscreens & Pop Filters at best price in Pakistan from our online shopping store in Pakistan such as; Mudder Recording Studio Microphone Mic Windscreen Pop Filter with Double Layer, Compete Audio CA555 large windscreens (2-pack) for use with mini-shotgun mics, larger headsets, Audio 2000s AWS4071 7.4" Dual Screen Clamp on Microphone Pop Filter Wind Screen and others. Place your order instantly and get the best of imported quality products at best price in Pakistan with cash on delivery across Pakistan right to your locale. Dual layer 4.75-inch nylon mesh screen reduces "P-Pops"